Is Home Health a Solution to Rising Health Costs? Despite good news in recent weeks about the future of health care spending, a daunting reality remains: The projections may turn out to be true for the next decade, but in the more-distant future, what can be done as Americans get older? For participants at a workshop held Tuesday by the Institute of Medicine and the National Research Council the answer was clear: Home health for seniors and people with disabilities can not only rein in costs, but can give people better health outcomes and the kind of care they want. The workshop came on the heels of an IOM report that says families do not talk about how they want to spend their final days of life. Home Care — Los Angeles The report showed that this lack of communication leads to longer hospitalizations, high medical bills and emotional turmoil for families. Experts from the National Hospice and Palliative Care Organization say 90 percent of Americans prefer to spend their final time at home. If they don’t express this, however, they are more likely to die in a facility instead. Home health care can include rehabilitative care after surgery, hospice care and palliative care, which is dedicated to relieving people’s physical and emotional symptoms as they face a life-threatening illness. The care options for home care are both social and medical, and can include medication reminders, family notifications, making appointments, arranging transportation and meal preparations. “People often don’t know about home care unless they hear about it in an emergency situation,” says Barbara McCann, chief industry officer for Interim HealthCare. Dr. Steven Landers, president and CEO of VNA Health Group, says a person who undergoes surgery and is transitioned to home care for a month can expect a bill for about $1,200 — as opposed to a $12,000 bill for a skilled nursing facility, such as a nursing home. He noted, however, that in some cases patients need a range of medical help that only a nursing home can provide. Still, he says, “More people can go home.” The industry continues to innovate technologically, he says, providing more opportunities to get the care patients need. Companies are also developing more modern training and a better process for medications. Laws are also expected to help propel the industry forward. The Home Health Improvement Act, for instance, would allow nurse practitioners to take a lead on home health provisions, allowing for a greater opportunity to get care. So far it remains at a stalemate in Congress, however. As expected, home health use increases with age. Recent findings from the Centers for Medicare and Medicaid Services show baby boomers at this time are contributing to the rate reduction in Medicare spending. More people in the early stages of Medicare — meaning, those who most recently turned 65 — have enrolled in the program, resulting in a younger average age for Medicare beneficiaries and therefore a healthier senior population overall. But the reality is that since 2011 a wave of 77 million baby boomers only started to become eligible for Medicare. Though the Centers for Medicare and Medicaid Services projects that during the next decade rates of health care spending will rise at a lower rate than in the past, the following period may be dire. The population of people 80 and over nearly triples between 2010 and 2050, says Tricia Neuman, a senior vice president of the Kaiser Family Foundation. “We’ll have slightly declining deficits this year and next, then it’ll just go north from there,” Holtz-Eakin says. As people age, they are not only less likely to be healthy but their medical care also is likely to cost more. 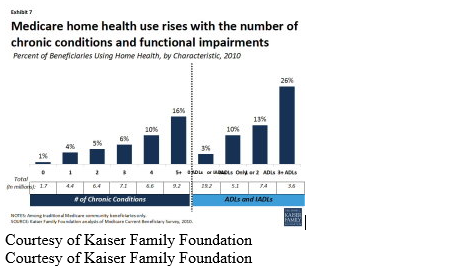 Currently about two thirds of all Medicare home health patients have four or more chronic conditions, according to data data from the Kaiser Family Foundation. In addition to their chronic conditions, elder patients can have functional impairments, such as difficulty walking. A provision in the Medicare Home Care Act allows for the government to pay for some beneficiaries to receive care at home if a doctor certifies it is needed. Medicare will not pay for nursing home services, but Medicaid will assist patients whose assets have been depleted to below $2,000. 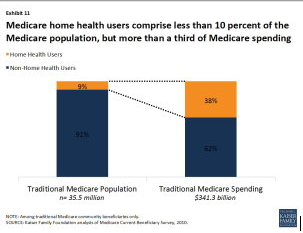 Medical industry players and policy makers expect the demand for home health to increase in coming years, much more significantly than it has in recent years, from 7 percent share of Medicare in 2000 to 8.8 percent in 2011, according to data from the Kaiser Family Foundation. Despite projections, providers appear optimistic about trying to handle the outcomes. Home Care — Los Angeles Landers does not think resources will need to be restricted from those who want them, particularly because findings show that people are more likely to want at-home care.The Institute of Medicine report showed people not only feel home care gives them a better quality of life and dignity, but that it also happens to be less expensive. “If we focus on respecting people’s wishes … we can both improve quality and cost,” Landers says.